Diana Stec - dried out version! From zero to full licence in just five days – how about that then! 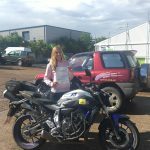 A super well done Diana, apart from having the wettest day ever for your test, you did a grand job and got what you wanted – that full licence! Yet but another triumph for the lowered MT-07!